Our guides show you their city. 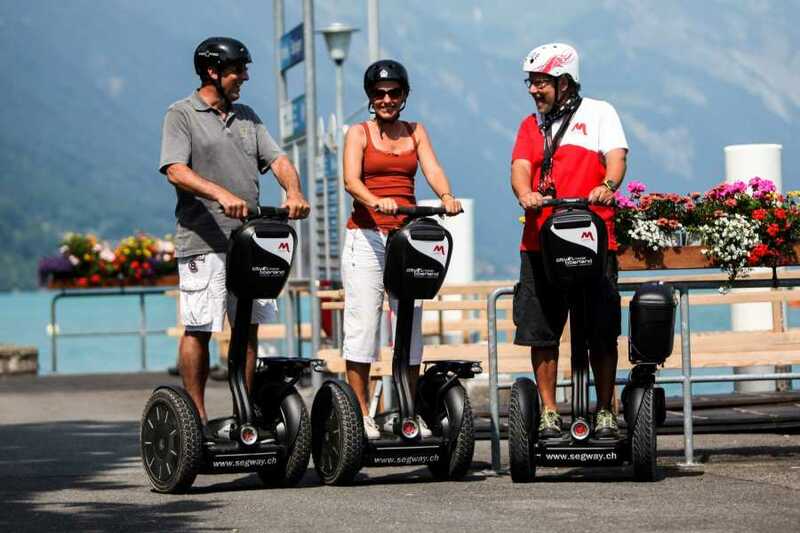 Come with us on an interesting and unforgettable tour through Interlaken and the surrounding area with the innovative Segway! Our tour begins at the City Hotel Oberland and passes over the emerald green waters of the Aare River into the picturesque old town of Unterseen, whose roots date back to the late 13th Century. Here we have a fabulous view of the mountain scenery of the Eiger, Mönch and Jungfrau. We continue along the Lombach River until we arrive at the well-known Neuhaus, where the Lombach flows into the Lake of Thun. At Neuhaus we enjoy the perfect combination of water and mountain worlds in an idyllic setting. As the tour continues we stop at the the Weissenau ruin, a former castle built at the edge of the lake. We cross the Aare River once more, pass the Interlaken West train station and go on through the Wagneren canyon. Here we can test our mastery of Segway driving and experience the capabilities of the Segway PT that carries us up a lengthy ascent with undiminished speed. Other sights along the way include the Rugenbräu Brewery, the amazing Unspunnen ruin and the village center of Wilderswil. We drive across the RUAG Airport to Bönigen and the Lake of Brienz with its one of a kind enchanting clear blue-green water. The end of our varied tour includes the Interlaken Castle, the Japanese Friendship Gardens and the Höhematte in the center of town. We arrive back at our starting point in a total of 2.5 hours. Please note the Segway PT is classified as a small motorbike in Switzerland. No driver’s license is required from 16 years. A driver’s license of the category M (motorbike) is required for participants between 14 and 16 years. There is a minimum weight of 45 kg and a maximum weight of 120 kg for each participant. Previous consumption of alcohol, drugs or strong medication is not allowed. If one or more rules are ignored participanta can be excluded from the tour. This tour takes place with a minimum number of 2 participants. The tours are held in German. If you would like an English or French speaking guide, please contact us directly. We would love to create an individual offer for you. Please choose your clothing according to the weather conditions. Segway Citytours only take place in good weather conditions. Therefore we can not guarantee that a booked tour will take place on set dates/times. If a tour is cancelled because of weather related and/or safety aspects, participants will be rebooked.